and green of the Monte Baldo !! 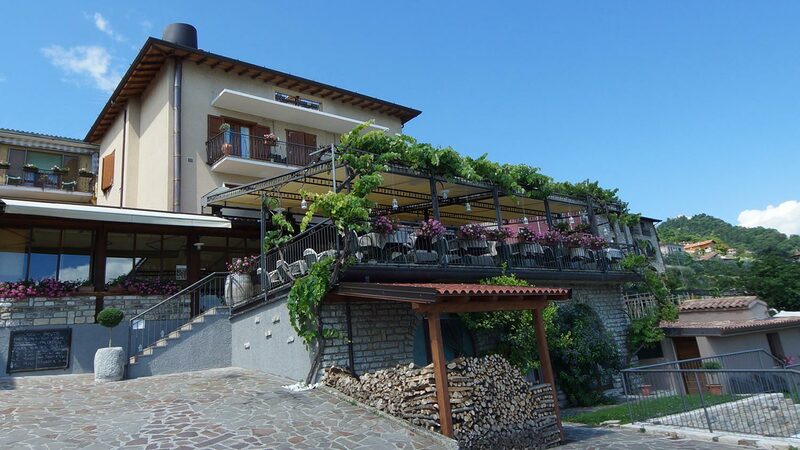 The apartments and the restaurant are dedicated to people who like to be surrounded by COMFORTABLE environment, simple BUT with TASTE and who like to be pampered by good food and lovely wine surrounded from a beautiful lake view. Easy to reach the historic centre of Gardola with main road with sidewalk or with an old road that leads directly to the main church and the city centre where you will find shops, bars, newsagent, bakery, butcher, bank, post office etc. The apartments are cosy, comfortable, well heated and when very hot during the summertime feature air conditioning. A kitchenette will allow you to cook your breakfast, lunch and dinner and from the living room or from the balcony you have a magnificent view. Below the apartments you will find our Terrace Restaurant with typical cuisine. When you wish, you can spend your evenings here, savoring good food and a good glass of wine, enjoying the wonderful view of the Lake. The place is very quiet and usually in summer has a nightly closure at about 11.00 p.m. If you like you can take food up to enjoy in tranquility in your apartment. ... and if you are craving for a Pizza, at about 100 mt. from here you will find our Pizzeria Ruculì. A green corner equipped with sun beds, shower and herb garden will allow you to relax. It is our purpose to make you feel good and make your vacation special and remaining in your heart! !